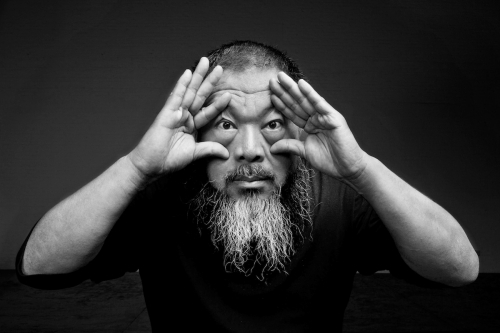 A cultural figure of international renown, Ai Weiwei is an activist, architect, curator, filmmaker, and China’s most famous artist. Open in his criticism of the Chinese government, Ai was famously detained for months in 2011, then released to house arrest. “I don’t see myself as a dissident artist,” he says. “I see them as a dissident government!” Some of Ai’s best known works are installations, often tending towards the conceptual and sparking dialogue between the contemporary world and traditional Chinese modes of thought and production. For Sunflower Seeds (2010) at the Tate Modern, he scattered 100 million porcelain “seeds” handpainted by 1,600 Chinese artisans—a commentary on mass consumption and the loss of individuality. His infamous Coca Cola Vase (1994) is a Han Dynasty urn emblazoned with the ubiquitous soft-drink logo. Ai also served as artistic consultant on the design of the “Bird’s Nest” stadium for Beijing’s 2008 Olympics, and has curated pavilions and museum exhibitions around the globe.